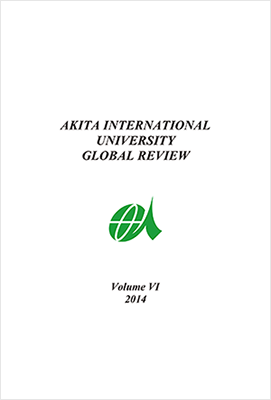 The Akita International University Press was established in January 2008 for communicating each faculty member’s achievements in education and research to institutions of higher education in Japan and abroad, as well as the wider world. AIU Press is committed to promoting the results of scholarly research and to publishing high quality teaching materials, with the purpose of furthering the goals of the University’s international liberal arts education. 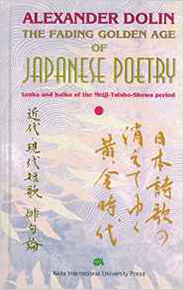 AIU Press publications are written in English, but address issues important for Akita, Tohoku, Japan, and the world from a global perspective, and contribute to the promotion of both local and global traditions and culture. 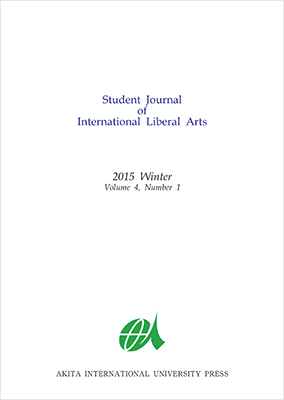 The “Student Journal of International Liberal Arts” provides a place for students and graduate students to present their creative academic studies in the liberal arts fields they spearhead. Topics include a wide range of fields such as politics, education, linguistics and history. Essays are always welcomed. 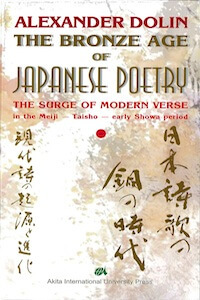 This textbook contains a collection of essays by over 30 Akita International University faculty members, assembled to exemplify the various rhetorical modes commonly taught in university-level English composition classes. 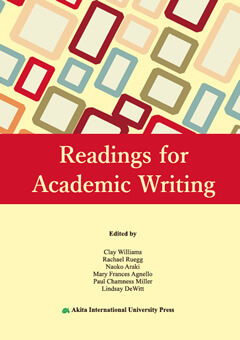 Varieties of writing represented include argument writing, compare/contrast, narration, classification, process, description, critical analysis, problem solution, explanatory synthesis, argument synthesis, and empirical research. 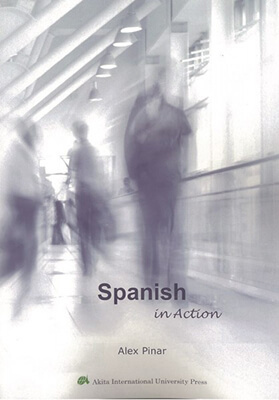 This textbook is a communicative-action-oriented course of Spanish. It is divided into three modules which correspond to levels A1, A2, and B1 of the Common European Framework of Reference. Each module contains the most relevant contents detailed for each level in the Instituto Cervantes' syllabus. 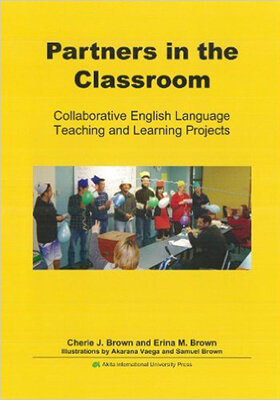 “Partners in the Classroom” is a unique volume that brings project-based learning alive for the contemporary ESL/EFL classroom. A practical volume that promotes a blend of language and content learning, and centres on seven detailed, easily adaptable and well-trialed projects, suitable for a range of levels. It includes comprehensive lesson plans, clear objectives, assessment tools and photocopiable material. Rogetsu Ishii (1873-1928) spent most of his life in his birthplace, Akita, whilst studying under Shiki Masaoka. 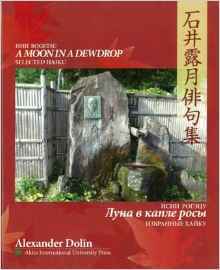 This book introduces the poems of lyrical poet Rogetsu, who lived from the second half of the 18th century to the first half of the 19th century, in Japanese, English and Russian. 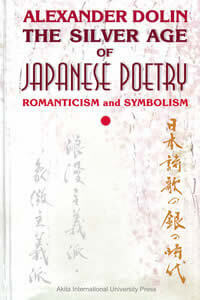 The book also includes many photographs of the hanging scrolls created by Rogetsu. 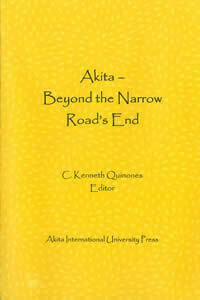 The modern version of Oku no Hosomichi (Narrow Road to the Interior) depicts “Akita”, the home of AIU, from various angles. It is expected to be used to good effect as a teaching material in English for learning about “Akita”. 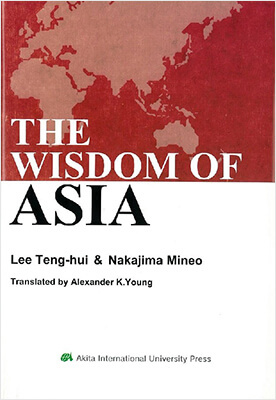 Two friends of long years, LEE Teng-hui, former President of the Republic of China (Taiwan), and NAKAJIMA Mineo, president of Akita International University, work together to ponder on the questions of history and future in East Asia, to derive therefrom the wisdom of Asia. 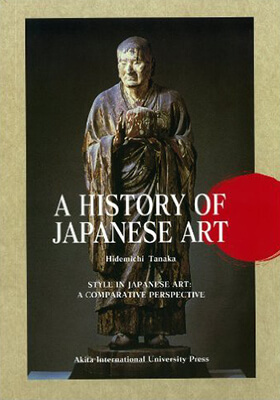 A definitive edition that covers the history of Japanese art from the Jomon period to today. It enables the reader to visually enjoy the history of art, as it includes many charts and photographs, in addition to extensive texts. Payment must be made in advance if ordering directly from the university. Order can be placed by fax or email containing the following information. An invoice will be sent in return, so please send the required amount of payment to the university’s bank account. The order will be dispatched once payment is received. ※Please note that the customer is liable for the relevant bank fees and shipping charge. Shipping charge and bank fees are payable. Check when placing an order. Defective products may be returned or exchanged. No product may be returned or exchanged because of the customer’s preferences. We will pay the shipping charge only for defective products. [Bank transfer] An invoice with our bank details will be sent once an order is placed. Product will be shipped once payment is received. Delivery will be made by post or courier. Shipping charge varies by the number of books purchased. Please check when placing an order.